Facebook Player AppCustomize your Facebook page and let your friends listen to your station! Stream Solution is one of the few providers that provide access to the logs of audience for their services through a simple and intuitive online interface. The log data is generated directly from the audience by streaming server to ensure maximum accuracy in the reports. The reports are a great marketing tool to attract new advertisers to advertise on their station. Why listening data are useful? Today there is a constant need to know the tastes of the audience and know their tendencies and affinities. The report meets the needs of all broadcasters by providing a margin of profit in the knowledge of their audience, allowing them to know right away whether a transmission is successful or not. 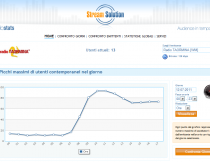 Thereal time report serviceis available for Shoutcast, Flash Media e Windows Media technologies. What can I see in the graphical statistics ?